Lucky recovers after a two-hour surgery to remove his left ear and close his wounds. 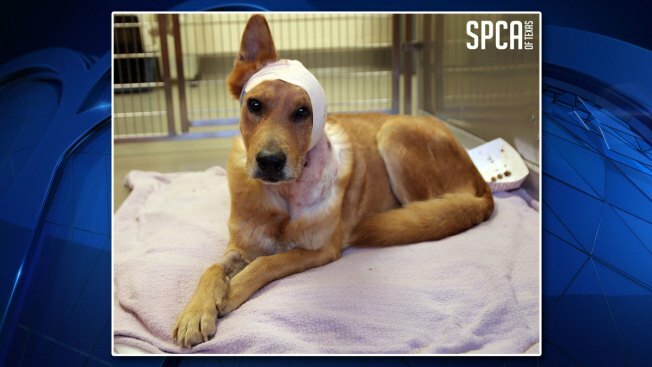 Dallas police are investigating an animal cruelty case after a 8-year-old Shepherd mix was found loose with severe injuries to his neck and left ear, according to the SPCA of Texas. Police picked up the dog -- named Lucky -- near Bannok Avenue on Saturday and noticed the injuries, Dallas police said. Police said after they identified the dog's owner, the owner agreed to give up the dog after failing to provide veterinary care for him. Dallas Animal Services transferred Lucky to the SPCA of Texas on Monday, and he immediately underwent surgery upon his arrival, the SPCA said. The veterinarian found Lucky had suffered bite wounds around the head, neck and left ear, which could have come from a fight with another dog, the SPCA said. The SPCA said the veterinarian determined the wounds were old and had gone untreated, as they contained maggots and signs of decay. The veterinarian removed Lucky's left ear during the more than two-hour surgery. Lucky will stay at the SPCA while he recovers, and will be evaluated for placement once the police department's animal cruelty investigation is complete.